The concept of an “urban winery” is quite simple: bring in grapes from outside vineyards, press, ferment, age, and bottle them in an large urban space. While it lacks that rustic/schmancy charm of a winery actually in the vineyards, there’s no reason that they can’t make good wine, primarily for the fact that almost all wineries buy grapes from other vineyards despite the impression you might get from those rows of grapes in front of their tasting room. Portland, Oregon has its own urban winery scene with currently eight different wineries. That’s not bad given that in San Francisco (a city about three times as big as Portland and a nexus for the major wine regions of California) there are only two, one of which being on Treasure Island. It appears that urban wine space isn’t as reasonable in SF as it is in Portland. We went to the original which was started in 1999 called, Hip Chicks do Wine. 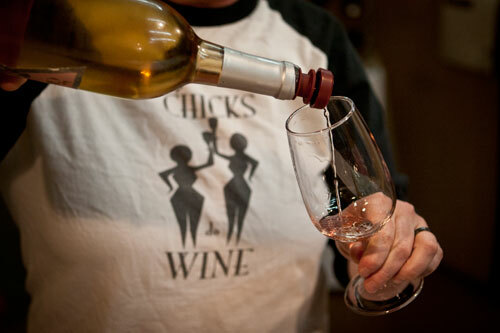 As the name implies, it’s a winery run and owned by women who source most of their grapes from nearby Willamette Valley. Tucked away on a well-signed warehouse just south of Holgate Blvd. and next to the railyard, they’re a mighty friendly lot that work there and overall, they make a readily drinkable, approachable, and pleasant line of wines. For instance, their 2007 Sangiovese is a fine red wine with good acidity, bright, full fruit, and a clean finish. Naturally, these are elements not often found in Willamette grapes, so they source from Yakima, Washington. Also from Yakima is their 2007 Malbec which has pleasant plum notes, and a neutral, smooth body. 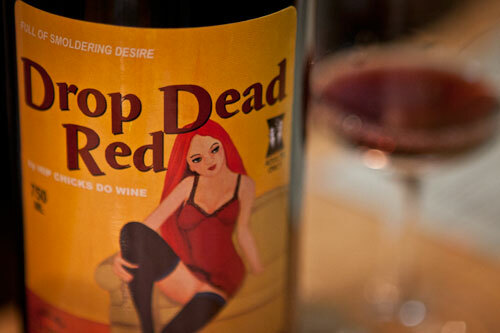 One of their blends, the Drop Dead Red was quite notable for how ready-to-drink that it was and ready to be paired with a great variety of meals. Some people wanting the “highfalutin” wine experience might be put off by their kitschy labels. Others might like them, but really, labels don’t mean a damned thing when it comes to how good the wine is and these “chicks” are all about making good wine that most anyone can immediately enjoy with or without meals. You should stop in if you find yourself in Portland.